From the lgbt+ neighborhood on Facebook, in a discussion that started with ukuleles — there was actually some convoluted lgbt-relevance in that — and turned to accordions (plus some bagpipe stuff), whereupon I spoke approvingly of Astor Piazolla’s music as performed on accordions and even more of Antonio Soler’s keyboard music (in particular his sonatas for various keyboard instruments, including the organ) as arranged for accordion. Adding that Joseph Petrič has wonderful recordings of some of the sonatas on accordion (I have his 1997 CD). Oh, I particularly like the F♯ Major sonata — it strikes me as rather silly, and *who* writes in F♯ major anyway? And that set me off. F♯ is the key of the minuet in Joseph Haydn’s “Farewell” Symphony, of Beethoven’s Piano Sonata No. 24, Op. 78, of Chopin’s Barcarolle, of Verdi’s “Va Pensiero” from Nabucco, of Liszt’s Hungarian Rhapsody No. 2, of Mahler’s unfinished Tenth Symphony, of Erich Korngold’s Symphony Op. 40, of Scriabin’s Fourth Sonata. The key was the favorite tonality of Olivier Messiaen, who used it repeatedly throughout his work to express his most exciting or transcendent moods, most notably in the Turangalîla-Symphonie. With 6 sharps, it’s a rarely used key signature — so it’s scandalous that the article omits the Soler. I love the F♯ Soler: like many of the padre’s works, it strikes me as circus music, but exceptionally fine circus music (unsurpassed in this line until Chopin’s Etudes came along) — bright, exuberant, simultaneously playful and muscular. With very hesitant memory, I recall a performance by E. Power Biggs and Daniel Pinkham of some of these works at Harvard’s Busch-Reisinger Museum, with Biggs playing the Flentrop pipe organ he was instrumental in bringing to Harvard. … I say “with hesitant memory”, since I can’t recall any details of the performance, so I can’t swear that Ann and I actually were in attendance. 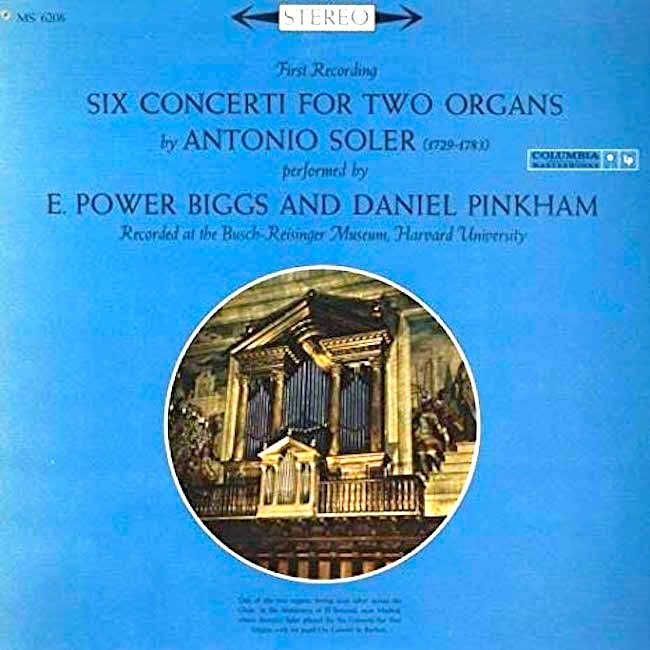 But we certainly had the recording by Biggs and Pinkham in our Cambridge apartment, where we played it nearly to death; hardly anyone had heard of Soler. (That was a vinyl recording, now long gone from my music collection; it seems not to have been released on CD, so now I have several alternative performances on my iTunes.) Memory is a fragile thing. Very few symphonies are written in this key, Haydn’s Farewell Symphony being one famous example [recall that the Farewell Symphony also has a section in F♯ major]. … The few concerti written in this key are usually written for the composer himself to play, including Rachmaninoff’s Piano Concerto No. 1, Scriabin’s Piano Concerto, Wieniawski’s Violin Concerto No. 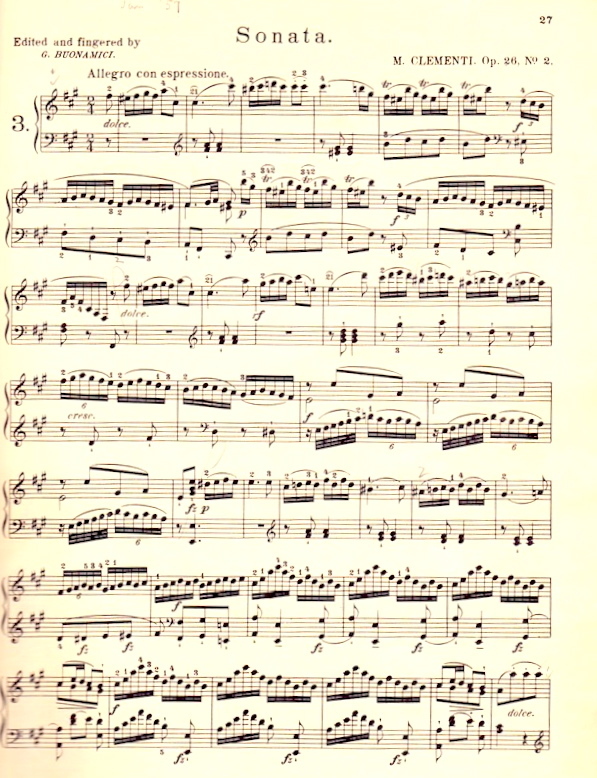 1, Vieuxtemps’s Violin Concerto No. 2, and Koussevitzky’s Double Bass Concerto. Handel set the sixth of his eight harpsichord suites of 1720 in F-sharp minor. Aside from a prelude and fugue from each of the two books of Das Wohltemperierte Klavier, Bach’s only other work in F-sharp minor is the Toccata BWV 910. Mozart’s only composition in this key is the second movement to his Piano Concerto No. 23 in A major. Another rare key. No mention of the Clementi, alas. Back when Ann and I lived in Cambridge MA, during exam weeks the student-run radio station at Harvard (WHRB) would run “orgies” of music on some theme, in 6- or 12-hour chunks (occasionally longer: the Ring Cycle came around every few years, apparently). So Ann and I once got to experience 6 hours of music in F♯ minor. Including this Clementi! This entry was posted on February 28, 2019 at 7:28 pm and is filed under Memory, Music, My life. You can follow any responses to this entry through the RSS 2.0 feed. You can leave a response, or trackback from your own site. Great post. One question, which I kind of hesitate to ask–did you edit the Wikipedia article about F# major to include a mention of Soler? As an aside, when I first say F# major, I had visions of a forest of sharps, but F# minor, on the other hand, is comparatively an “easy” key, no? Long time approving this comment, because I wanted to clarify the first point in e-mail, but I’m overwhelmed with things, so this will have to do. #2: F# minor is indeed a comparatively easy key for reading from a score (its relative major, A, is a very common key). Apparently the problems of F# minor have tainted F# major as well.